It's a chilly winter evening. A northern gannet lets out a loud graaak. Swiftly and carefully, a scientist scoops the bird off the surface of the water into a net so that a team of experts can implant a high-tech tag. Scientists will track this seabird—and many others—to learn its movement patterns over the following years. Find out how scientists are working to ensure clean, renewable offshore wind power won't spell disaster for the millions of seabirds that play a critical role in the ocean food web. Scientists study seabirds to see how they might be affected by wind farms and to suggest appropriate placement for turbines to generate that nonpolluting, renewable energy. Up and down the mid-Atlantic coast from Rhode Island to Virginia, politicians and engineers are looking for places to construct offshore wind farms, similar to those already providing clean energy around the country. 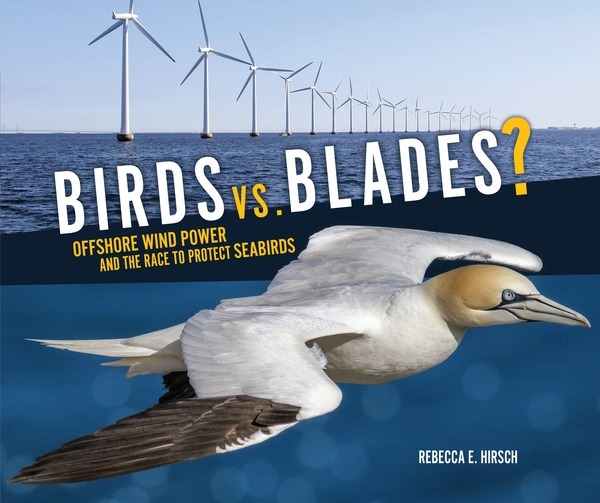 Hirsch's timely text explains this energy source, touches on why we need wind farms and how they work, and describes a four-year scientific study of gannets, scoters, and red-throated loons. She focuses particularly on the gannets, graceful ocean divers whose movements were previously a mystery. In successive chapters, she introduces the problem, then describes two nighttime boat trips to capture, band, and fit some birds with transmitters, which will reveal their whereabouts for a year. She reports on the travels of one tagged male and on life in the gannet breeding colonies off the east coast of Canada. She concludes with a more nuanced explanation of the hazards facing gannets and other seabirds. Laced with well-captioned photographs, maps, and blocks of sidebar text, the pages are attractively designed. There's lots of information here, but there's also lively action, a sense of immediacy, and a recognition that there are still far more questions than answers. Wind farms along the Atlantic coastline provide sources of clean energy but are dangerous to migrating seabirds. This book follows a team of veterinarians who gather research on northern gannets, red-throated loons, and surf scoters. They hope to discover more about the birds’ migratory paths and establish a database with their locations, food sources, and populations. Divided into six chapters and filled with colorful photographs, maps, and sidebars, this is an extensive piece of work. Not only is there data about the birds, there are also abundant explanations of the work of the vets who capture and tag the birds. Readers are challenged to become good stewards of the ocean and learn more about migratory birds and offshore wind farms. VERDICT Tightly written text and rich photography make this a must-read for those interested in environmental science and clean energy. Use this in classrooms to get debates on clean energy started. The blades mentioned in the title are attached to offshore windmills, and the question explored is how they will affect the populations of seabirds on America’s Atlantic Coast. After discussing the advantages of wind power and its dangers for birds, Hirsch takes readers along on a research boat venturing into the mouth of the Chesapeake Bay at night. Scientists capture three gannets and carry them to the lab for the surgical insertion of tracking devices. When the birds are returned to the wild, their movements will be studied. The last chapter summarizes the results of similar research over a four-year period. The concluding page, “Saving the Ocean,” details steps that concerned readers can take (saving energy, using less plastic, and choosing seafood responsibly) to protect the marine environment. The many illustrations include helpful, digital maps and diagrams as well as many color photos that are clearly reproduced, pertinent to the topic, and often eye-catching. This handsome book offers a well-researched and enlightening discussion of a topic seldom mentioned in children’s books. Onshore and offshore wind farms are designed to generate clean, renewable energy, an important way to decrease the use of fossil fuels. But what about the impact of wind turbine installations on birds and wildlife? What is the relationship between offshore wind farms and the survival of seabirds, such as the northern gannet, that depend on the ocean for food? Could seabirds share space with wind farms? Is it possible to place wind farms so that they will not interfere with bird migration patterns? Many questions are explored in this amazing picture book. Colorful photographs of birds and wind turbines, diagrams, and maps provide information on how offshore wind farms work and on the relationship between the natural world and the human desire to harness wind power. Scientists are discovering ways to protect the millions of birds as the construction of offshore wind farms increases. While reading this book, students will explore both sides of the problem as they learn how scientists attempt to find satisfactory solutions to the environmental challenges of producing renewable energy while protecting seabirds.